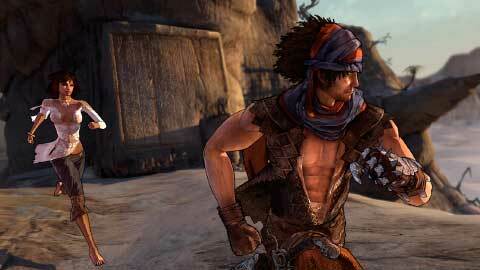 Not too long ago I acquired Prince of Persia on the XBox 306. I’m just over half the way through it so I thought I’d share my experience up till now. So, let me just start off by saying that I really wanted to love this game as much as I did Sands of Time on the Gamecube and, while it’s not a complete disappointment, I am left somewhat deflated by it. It starts off well enough, fantastic graphics, large expansive vistas, fluid game play (except the combat) and overall, it’s very well polished. The music captures the atmosphere well and fits with the whole Arabic fantasy theme. I was initially dismayed though to discover that the prince is a wise-cracking American. I don’t have anything against American accents, I just didn’t expect it from a game set in Arabia. Anyway, I did get used to it and found that I was becoming more immune to it as time went on. The whole running and jumping thing is something that takes some getting used to (and I’m a fan of the previous POP games), knowing exactly when to press certain buttons to chain the moves, allowing you to reach higher areas or just for travelling between areas. It can get a bit irritating when you’ve fallen for the umpteenth time. Usually though, it’s a combination of scoping ahead before you set off and/or falling when its not obvious what to do in that crucial split second, then going back and doing it again. Another huge part played is that of the princess, who follows you around wherever you go. She helps out by saving you when you fall, giving your longer jumps a bit of a boost and by being the main proponent in reclaiming the corrupted lands. Despite all of her usefulness, it’s the parts of the game where the princess helps out that you really start to wish didn’t exist. In such a huge world, with such a massive scope for falling it’s definitely useful to have some sort of ability to quickly correct any slip-ups that lead to certain death at the bottom of a dark precipice. Sands of Time used a rewind capability which worked seamlessly and didn’t make you feel like you were cheating. The new game uses the princess to save the prince if he falls too far, by means of grabbing his hand and lobbing him back to the last flat platform that you were standing on. It’s a bit of a clumsy mechanic, better by far than merely ending the prince’s life and giving you a game over, but still. Perhaps there should have been more focus on, 1: how the environment could have eased this and 2: a more compelling risk-reward device. The combat isn’t quite there either, it feels lethargic and a bit of a lottery at times. There are simple minions dotted about here and there who don’t prove too much trouble but its the boss fights that are the most irritating. They seem to have adopted God of War’s QTE events for parts of the fights – said boss enemy will manage to land a couple of hits, triggering tedious sequences where you have to mash a button to avoid getting your head rammed into the ground. It really doesn’t take too much imagination and I guess that’s why many developers are using it more and more often. God of War’s implementation was fantastic, but POP just leaves you feeling cheated. About a third of the way through the game, the monsters you fight become covered in ‘corruption’, which really just looks like an oil slick with tentacles. This ushers in what I think is the worst decision in the game – to render the sword useless in fighting corruption-covered foes, defaulting to the feeble efforts of the princess. There’s never any consequence of making mistakes in fights – the princess saves you and the enemy’s health goes up a bit. You’re left feeling that the developers just made the fights deliberately frustrating to somehow balance this out. The result is that, despite your best efforts and research of the combo hierarchy, you never really feel like you won convincingly or deserved victory. I think the best way to describe the new Prince of Persia is bitter-sweet: you’re glad the princess saves you when you fall, but you’re pissed off that the next move was so obtuse you couldn’t have guessed it on the fly, you’re happy you managed to land an acrobatically dazzling combo on an enemy but pissed off that every other attempt was thwarted by the enemy’s unhaltable QTE events. I’m gonna stick with this one and play it through. If this is your genre then go for it but if you’re more of a jack of all genres, I’d suggest spending your valuable gaming time elsewhere.